Friday afternoon, I began a journey into a lifetime of stored ‘stuff.’ This was a step that I knew I had to take before I moved, and despite all the preparation I did in the Spring of 2010 when I first decided to sell my loft, the main work of dealing with the stuff in storage, shoved in drawers, etc. has been looming all this time. I’m a big believer in the flow of energy in life, and certainly in my home. I have greatly minimized the ‘things’ in my space over the years, yet there were hidden pockets of stuff that just saw the light of day for the first time in years (and in some cases, decades). If my life were a ship, I would have been cruising through the water with barnacles all over the hull slowing my forward movement and keeping me from going the distance I wanted to go. This post is not about minimalism per se. There is certainly no shortage of bloggers who share the joys of living a minimalist life. I follow several of them and get inspiration from their stories quite often. This post is about my personal experience with this process. Hopefully by sharing, it might help others who are dealing with a similar situation. For the last couple of months, I have wanted to purge my desk and filing cabinet. My idea was to dump a drawer out in the middle of the room to signal the beginning of the process. That’s how it started this past Friday afternoon. 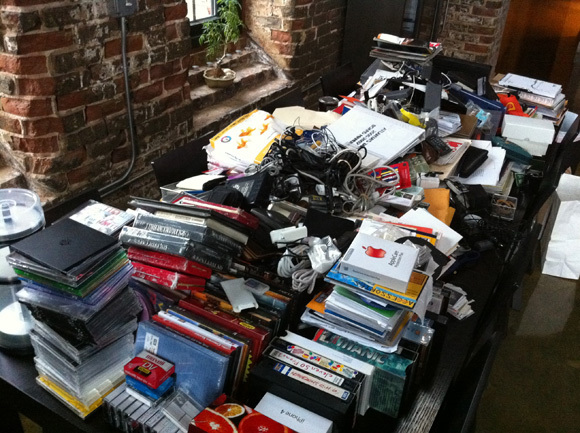 By the time I emptied the desk and filing cabinet ‘stuff,’ there was a heaping pile on my dining table. I couldn’t believe the mound of random things that was staring me in the face. It was overwhelming, and I wasn’t sure where to begin. I read a post on minimalism by Courtney Carver recently about what to do when you are faced with wanting to get rid of old stuff but are holding onto things for sentimental reasons. The advice was to take a picture of the things that are hard to get rid of, so that you have an image that you can refer back to again and again. I thought that was an awesome idea, so I put that to work for me, with a twist. I shared the process on Facebook, so my friends could see what I was doing. Some of the responses were hilarious, and were definitely worth the embarrassment of having accumulated all of this stuff. So, what to do with it all? Most of it is being donated to various charities that can actually use it. Another big chunk of it is being recycled. Just the paper stuff alone became several bags of recyclable material. And of course, the old electronic gear, CDs, etc. is all getting recycled or re-used. A few things are worth a few dollars, and they are going on eBay. It wasn’t until I decided to get rid of all this stuff and took action that I was able to experience all of it. All the years I have held onto these things, they have been hidden away, and I have not had the opportunity to look at the pictures, read the letters, etc. Now I’ve had a chance to relive those memories and document the most important ones for future reference electronically, without having to lug boxes of stuff around with me as I move through my life. Starting today, the ship will move much faster through the water, and with greatly reduced effort. I can honestly say now – I’m ready for the next chapter to begin. If you have ever considered doing a major purge like this, I highly recommend it. It is one of the most freeing experiences I’ve had in my life. If you’re not sure where to begin, just start with a single drawer. Dump it out and commit to dealing with the contents inside. You’ll be amazed what happens once you get the ball rolling. Today, I know that I am not my stuff. What about you? How do you deal with years of accumulated things when it’s time to move on?